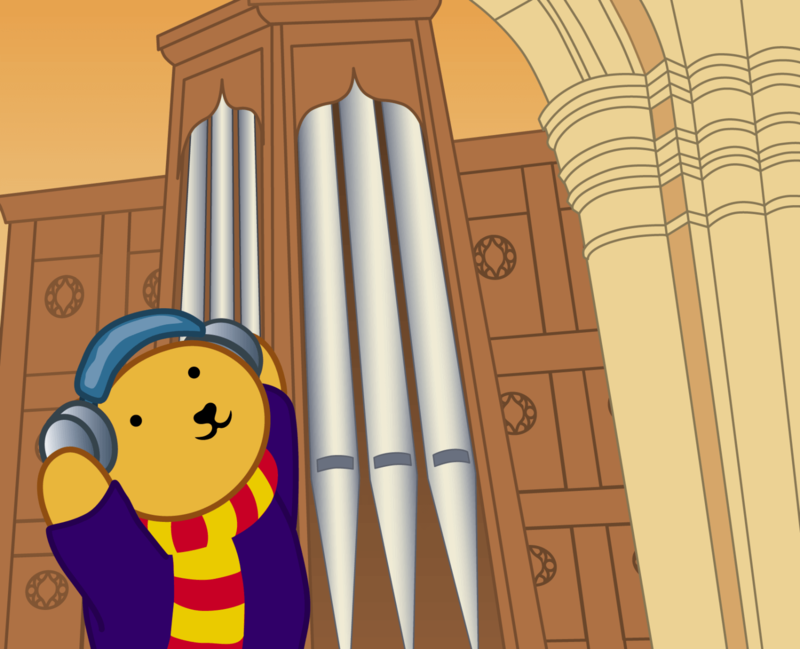 Teddy Horsley is a bear who likes visiting cathedrals. Today, Teddy Horsley is visiting Bangor Cathedral. 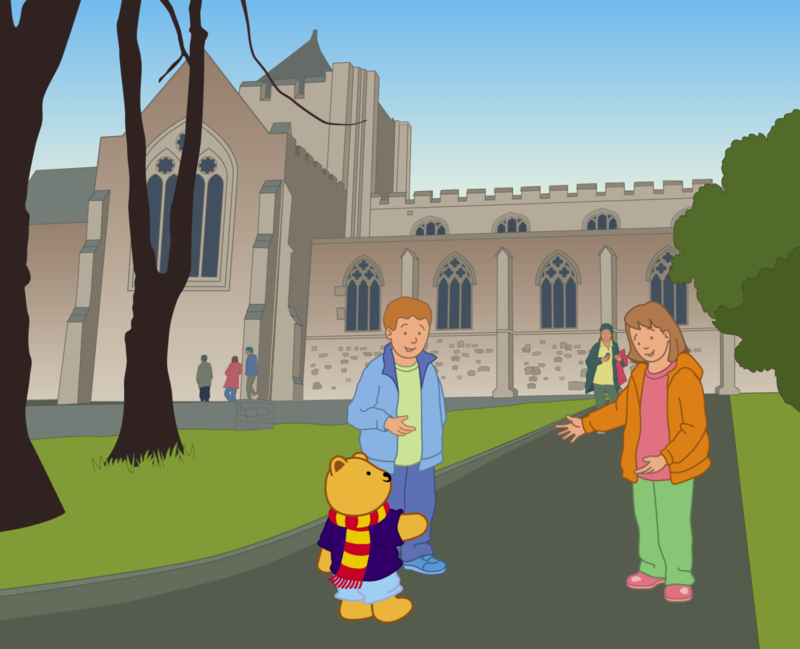 Teddy Horsley is a bear who likes visiting cathedrals. Today Teddy Horsley is visiting Bangor Cathedral. Teddy Horsley has travelled to Bangor in North Wales with his friends, Mr and Mrs Henry, Lucy, Walter and Betsy Bear. Together they are looking forward to walking all the way round the cathedral before going in to see the inside. Teddy Horsley is inviting us to go with him. The Cathedral Church of Bangor occupies one of the most ancient ecclesiastical sites in Great Britain. Deiniol, the founder of the Diocese was consecrated Bishop around 546AD. It is thought that Maelgwn, King of Gwynedd, gave Deiniol the land on which he built his church and dwelling place. Deiniol enclosed his land by driving posts into the ground and weaving branches between them. The name Bangor describes this kind of wattle enclosure. Teddy Horsley walks up the path from the car park. On the North side he sees the entrance where people gather and meet. Mr and Mrs Henry park their car in the car park below the cathedral. Teddy Horsley walks up the path from the car park with Lucy and Walter. They come first to the North side of the cathedral. The path leads them directly to the big door and to the entrance where people gather and meet. Teddy Horsley looks at the strong stone wall, at the buttresses and at the gothic window. The North aisle of the Nave was built between 1300 and 1350. The six windows are in the ‘Decorated’ style of that period. Simple buttresses between the windows strengthen the walls and help to support the roof over the aisles. The North side of churches and cathedrals is the side that never gets the sun. In many ancient churches the door on the North side was kept closed and the main entrance was on the South side. Bangor Cathedral is unusual to use the North door as a main entrance. Teddy Horsley walks along the path to the front of the Cathedral. On the East front he sees the large gothic window and fine stonework. The North side of the cathedral feels quite grey and dark to Teddy Horsley. 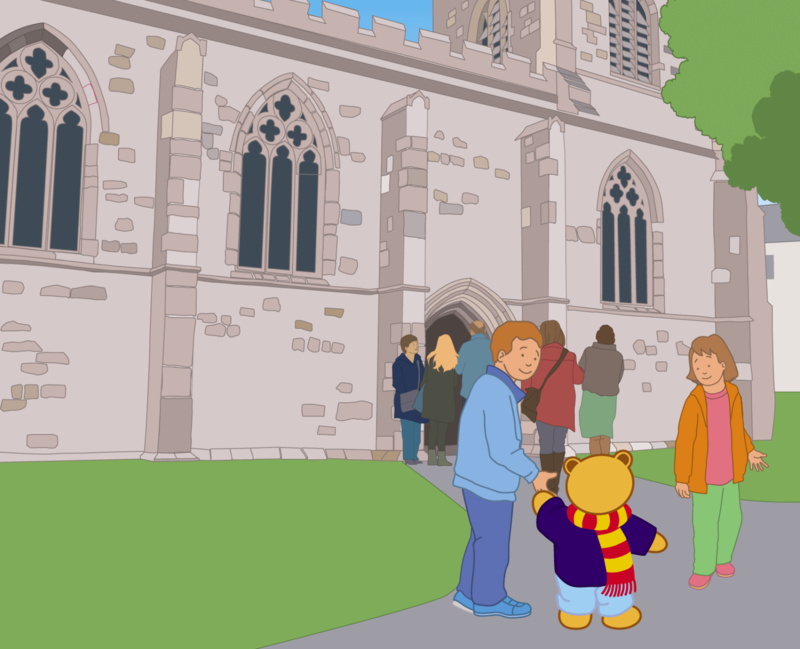 The sun hardly ever shines on the North side of the cathedral, so Teddy Horsley leads his friends round to the East front of the cathedral. 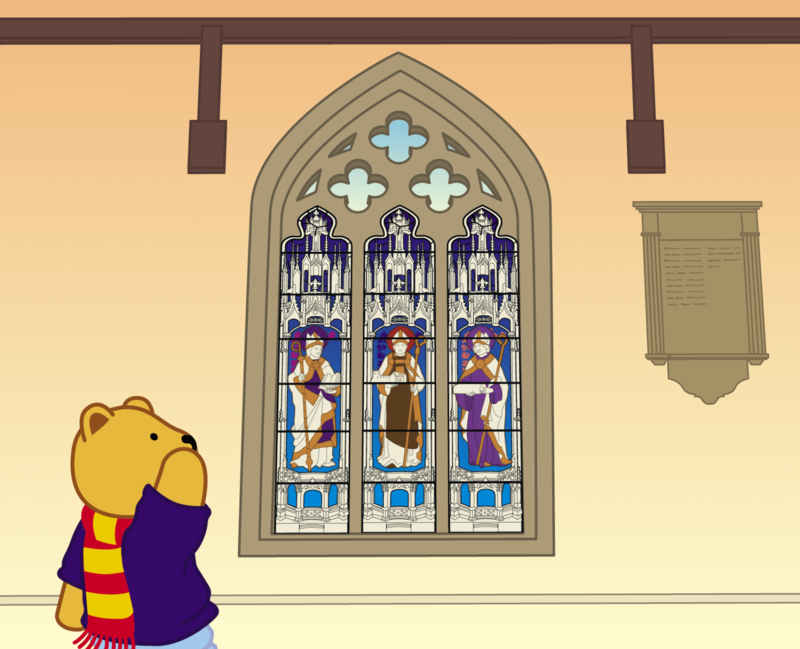 Teddy Horsley is inviting you to come along too, and to look up at the large gothic window and the fine stonework. When the sun rises in the morning it shines on the East front of the cathedral. The great East window was created about 1500 and is in the ‘Perpendicular’ style of that period. According to tradition this window was the gift of the Llwydiarth family of Llannerch-y-medd, Anglesey. The frame was carefully repaired by John Cooper of Beaumaris in 1785. The East end of churches and cathedrals is where the altar is placed. The light of the rising sun streams through the East window in the early morning and reminds us of the discovery of Jesus’s empty tomb early on Easter Sunday morning. Teddy Horsley walks across the grass and past the people who are talking. On the South side he sees the great length of the nave and the Lady Chapel. Teddy Horsley continues his walk past the big East window to the South side of the cathedral. He walks across the grass and past the people who are talking along the path from the High Street. During the day the sun is shining on the South side of the cathedral. The sun brings light to the great length of the nave and to the Lady Chapel. 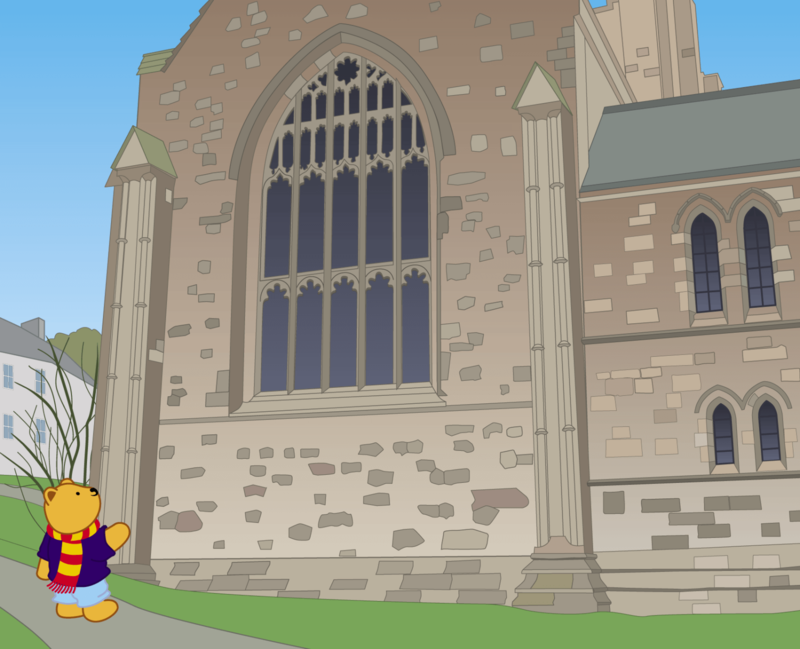 Teddy Horsley wants to go inside the Lady Chapel later on. Bangor Cathedral is built in the shape of the cross. 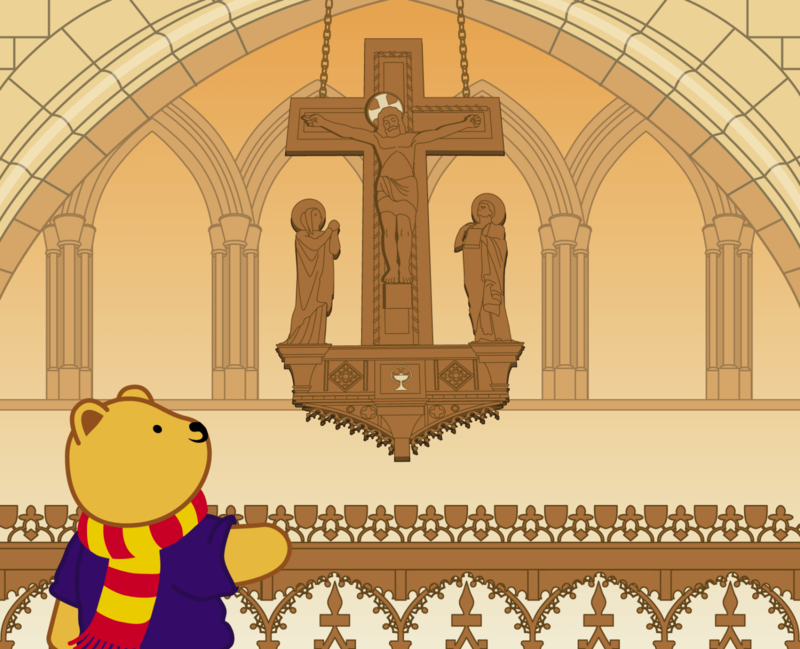 In the picture Teddy Horsley is standing by the South transept, that forms one of the arms of the cross. This was built around 1275 and is in the ‘Early English’ style of that period. It was rebuilt in the nineteenth century. The Lady Chapel occupies the South transept. 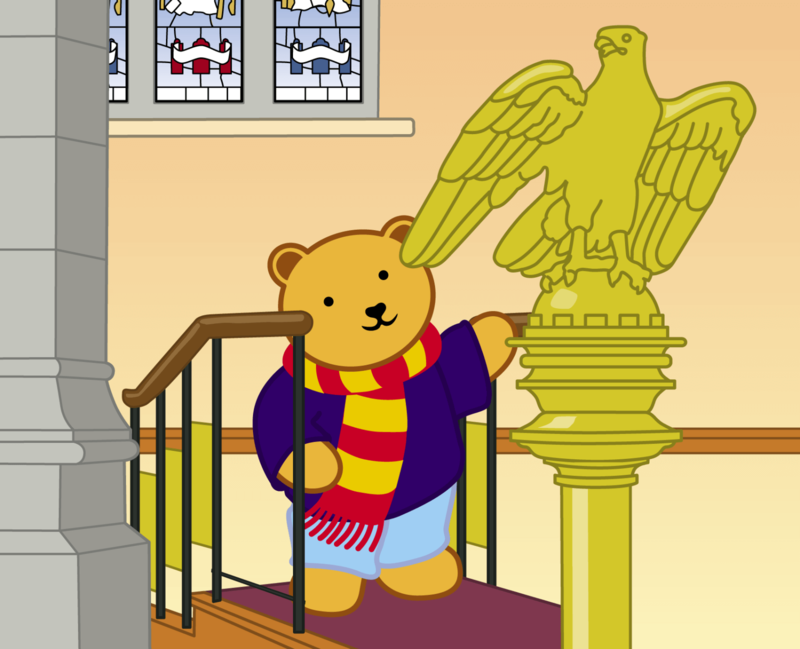 Teddy Horsley visits the Lady Chapel later. Like the North aisle, the South aisle has six windows in the ‘Decorated’ style of the period 1300-1350 and sturdy buttresses between the windows. 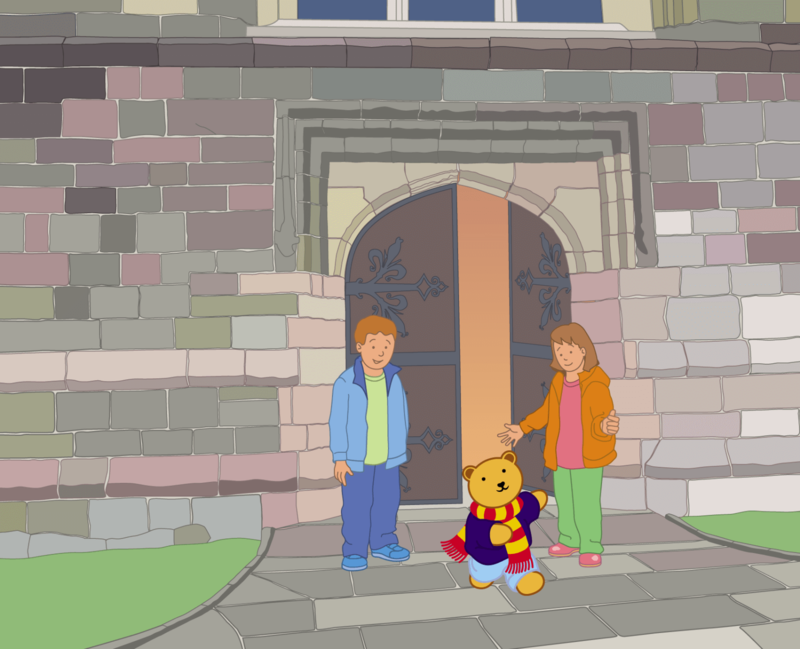 Teddy Horsley walks right round Bangor Cathedral to find the entrance. On the West end he sees the sturdy tower stretching up to the sky. 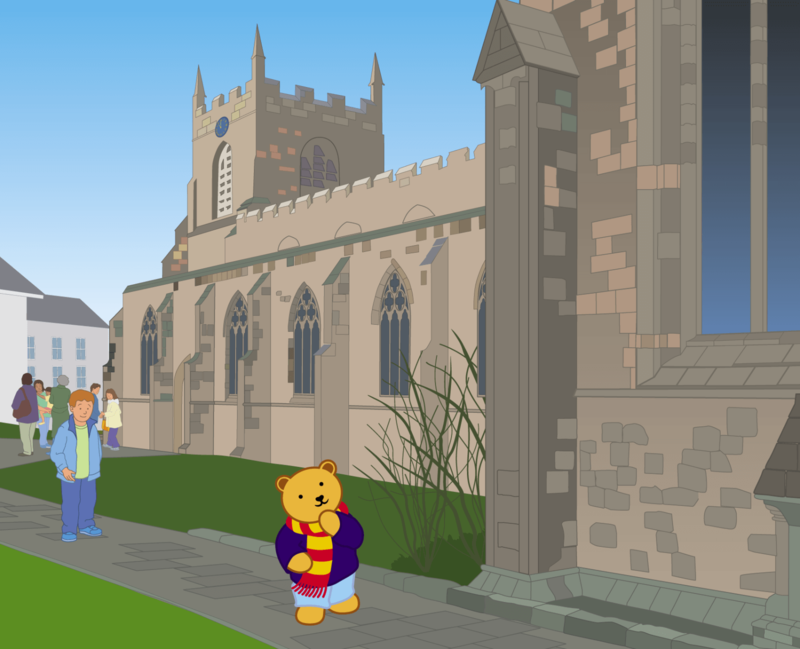 Teddy Horsley continues his walk right round Bangor Cathedral to find the other entrance. 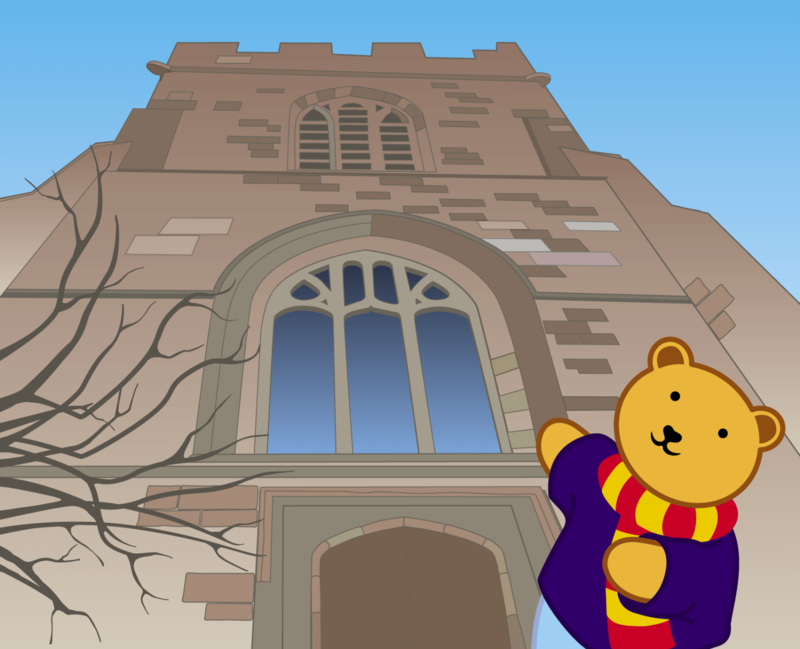 There on the West end of the cathedral Teddy Horsley looks up at the sturdy tower stretching up to the sky. There he sees glass in the window on the first floor to let light come in. There he sees slats in the window on the second floor to let the sound of the bells come out. In the evening the rays of the setting sun shine on the West face of the cathedral. The great West tower was the last part of Bangor Cathedral to be built before the Reformation. The Latin inscription above the door claims that ‘Thomas Skevington, Bishop of Bangor, had this bell-tower and clock built in the year of the Virgin’s giving birth, 1532.’ The tower is 61 feet high, and the pinnacles on top are 7 feet. The tower was built to house a ring of bells. In 1687 Thomas Roberts of Shrewsbury cast five bells to be hung in this tower. Now there are three bells in the tower installed in 1842. The largest of these bells, recast by James Barnett in 1878, weighs around 30 cwt and is the heaviest church bell in Wales. In recent years the West entrance of Bangor Cathedral has been opened up and a glass screen and door added. Now people can look inside the Cathedral as they walk up to the High Street, and the Cathedral can look out onto the city. Inside Bangor Cathedral Teddy Horsley lifts his eyes to the rafters and the roof. He stretches up high to point to the Rood hanging above the choir screen. Teddy Horsley walks through the open glass door at the back of the cathedral and invites us to follow him as he goes inside. From the back of the cathedral, Teddy Horsley looks straight toward the big East window he had seen from the outside. Now light is shining through the stained glass. Inside Bangor Cathedral Teddy Horsley lifts his eyes to the rafters and the roof. He stretches up high to point to the Rood hanging above the choir screen. When Teddy Horsley walks through the West door and up the central aisle, his attention is caught by the Rood hanging above the choir screen. The Rood was designed by Alban Caroe and dates from 1950. When Jesus therefore saw His mother, and the disciple whom he loved standing by, He said to His mother, “Woman behold your Son!” Then he said to the disciple, “Behold your mother”. And from that hour the disciple took her to his home. Looking up to the roof, Teddy Horsley shields his eyes from the light. He stretches up high to point to St Deiniol in the stained glass window. Still looking up, Teddy Horsley turns his gaze from the tall East window to look at the windows on the South side. There he sees the light pouring through three pictures of wise and holy saints. In the middle frame there is St Deiniol who founded Bangor Cathedral. In the left hand frame there is St Dyfrig, bishop and missionary. In the right hand frame there is St Beuno. All these holy saints shaped the Christian faith in Wales. Teddy Horsley is looking up at the stained-glass window in the South aisle to the left of the South entrance. This window is thought to have been produced by Burliston and Grylls (a company founded in 1868). The window is in memory of John Pryce, who was Dean of Bangor 1902-1903. The centre picture shows St Deiniol, the founder of Bangor Cathedral. As Bishop, Deiniol is wearing a mitre on his head and carrying a crosier in his left hand. In his right hand he is carrying a model of Bangor Cathedral. The left-hand picture shows St Dyfrig. Dyfrig served as bishop and missionary in south-east Wales. He died around 502 AD. The right-hand picture shows St Beuno, who is holding a model of an ancient parish chest. Beuno died around 642 AD. He was not a bishop, although according to tradition the early Celtic saints carried crosiers like bishops. Inside Bangor Cathedral Teddy Horsley lowers his eyes to the tiles and the floor. He stoops down low to point to the eagle, the fish, the rabbit and the bird on the floor tiles. Inside Bangor Cathedral, Teddy Horsley lowers his eyes from the window to the floor. He stoops down to point to the patterns on the floor tiles. There he sees the eagle with two heads catching fish. There he sees the rabbit hunting with a bow and arrow. There he sees the strange bird with its wings stretched out. Teddy Horsley invites us to look for these floor tiles too. - an eagle with two heads catching fish. It is believed that this was the emblem of the tribe of Coel Hen, the tribe to which Deiniol belonged. - a rabbit with a bow and arrow. Hunted animals hunting their hunters was a popular theme in medieval carving and decorative designs. - a peculiar bird which may be the ‘caladrius’. According to legend the caladrius visited the room of a sick person. If the bird looked at the sick person, this would be followed by recovery. If the bird did not look at the sick person, this would be followed by death. Looking down to the floor, Teddy Horsley opens his eyes wide in the darkness. He stoops down low to point to the mouse on the base of the carved table. Looking up from the floor tiles, Teddy Horsley opens his eyes wide with surprise. There on the base of the carved table Teddy Horsley sees a finely carved mouse. There are other mice just like this one hiding in other places in Bangor Cathedral. These mice are all the trade mark of Robert Thompson, the skilled craftsman who carved some of the fine woodwork in Bangor Cathedral. Teddy Horsley invites us to search for these mice. Medieval stone masons and carpenters often left their ‘signatures’ in their work, in the form of their individual marks or emblem. Some contemporary crafts people do the same. One well recognised contemporary signature is the ‘mouse’. There are several pieces of work in Bangor Cathedral made by a well-known carpenter who signed his work with a mouse. Teddy Horsley is looking at the mouse on the carved table in the choir. The same mouse is also on the font cover at the back of the Cathedral, and on the screen at the end of the South aisle near the entrance to the Lady Chapel. The ‘mouse mark’ shows that this is the work of Robert Thompson (1876-1955) of Kilburn, Yorkshire. Inside Bangor Cathedral all is quiet and still, and Teddy Horsley pricks up his ears. Out of the silence he hears the big church clock chime out loud from the tower. Inside Bangor Cathedral all is quiet and still as Teddy Horsley gazes at the floor tiles and at the mouse. 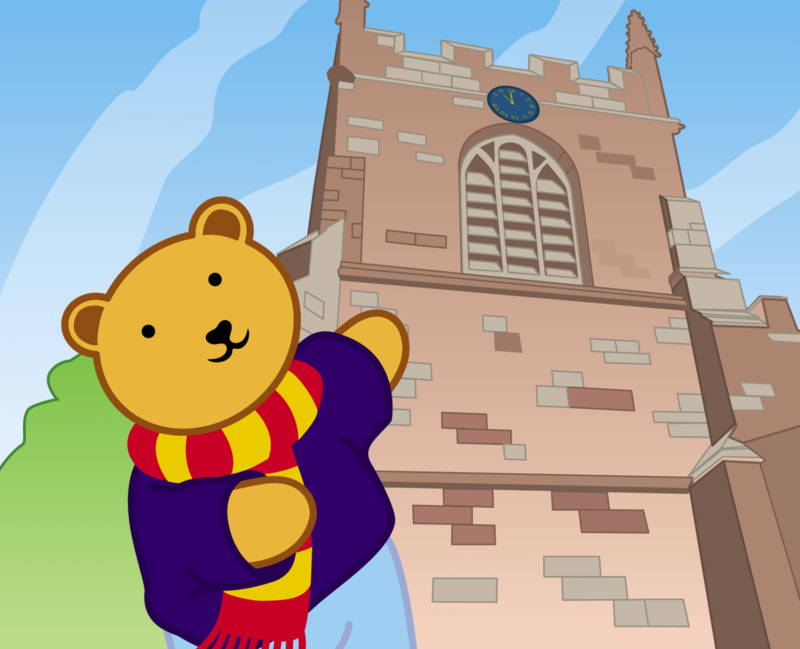 Then Teddy Horsley pricks up his ears as the big church clock chimes out loud from the tower. The bell is so loud and deep that Teddy Horsley feels the air move around his ears. The big church clock chimes out loud every hour. Ancient churches and cathedrals often have a clock in the tower. In the days before most people carried watches the church clocks provided a good service for the community. Those people who were not close enough to see the face of the clock could nonetheless know the time from the bell. The clock in Bangor Cathedral is relatively modern and is electrically operated. It replaces a clockwork mechanism dating from the eighteenth century that is now in Tresgawyn Hall, Capel Coch. Teddy Horsley walks to the mighty organ, picks up the head phones and presses the button. Out of the silence he hears the loud organ play church music. Getting up from the floor Teddy Horsley walks across to the mighty organ. He peers through the screen and sees the four great keyboards. He looks down and sees all the pedals. He looks up and sees the massive pipes. Teddy Horsley picks up the headphones and hears the mighty organ play. Bangor Cathedral organ is one of the best in Wales. Teddy Horsley invites us to listen to it. Organs have been an important feature of music in churches and in cathedrals since the middle ages. There are records of an organ being installed in Bangor Cathedral in the fourteenth century. The organ played in Bangor Cathedral today began life in 1873 and was created by the well-known organ builder William Hill. It has then been modified and extended over the years. This organ has four keyboards played by the organist’s hands and a set of pedals played by the organist’s feet. The keyboards and pedals are linked to many sets of pipes. Each set of pipes produced a distinctive sound. All told this organ contains 4,210 pipes, making it one of the largest in Wales. Some of the sets of pipes are made of metal and others are made of wood. The pipes range in size from something like a small pencil to the height of a house. Inside Bangor Cathedral all is quiet and still, and Teddy Horsley sniffs the air. He smells the fragrant perfume of the flowers near the high altar. Inside Bangor Cathedral all is quiet and still as Teddy Horsley walks slowly from the organ to the high altar at the East front. Teddy Horsley walks up the steps into the sanctuary and sniffs the air. There on the right hand side he smells the fragrant perfume of the flowers near the high altar. The flowers have been so skilfully arranged on the wrought iron flower stand. 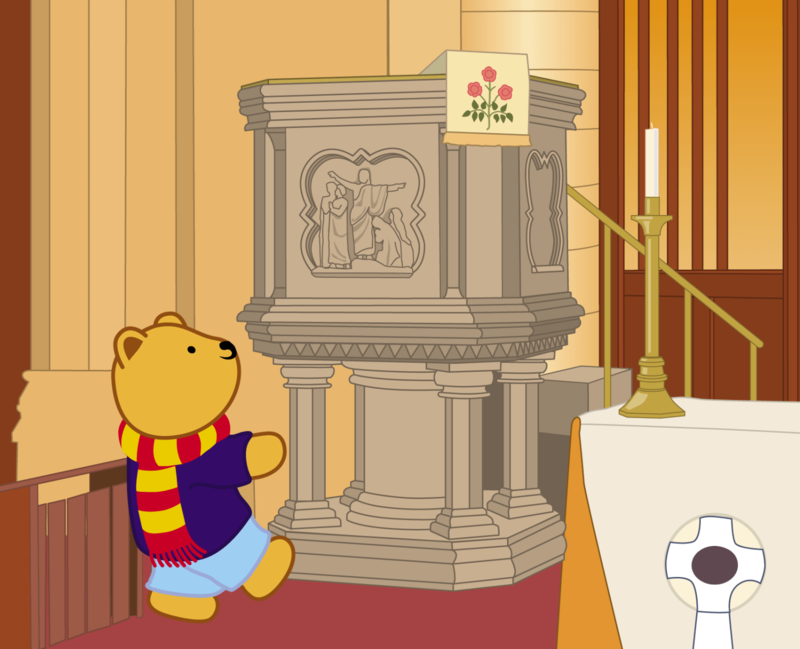 Teddy Horsley has walked into the Sanctuary to visit the High Altar where the early communion service is celebrated at 8:30am on Sunday morning. Behind the High Altar there is a fine Reredos which was designed in 1881 by Oldrid Scott, son of Sir George Gilbert Scott who has overseen the restoration of Bangor Cathedral. On the top of the Reredos there are golden angels carrying heraldic shields. Throughout the year, apart from during Advent and Lent, there are displays of flowers in the Sanctuary to give praise to God. Moving away from the flowers, Teddy Horsley takes a deep breath and sniffs the air again. He walks into the sanctuary and smells the rich fragrance of the incense. 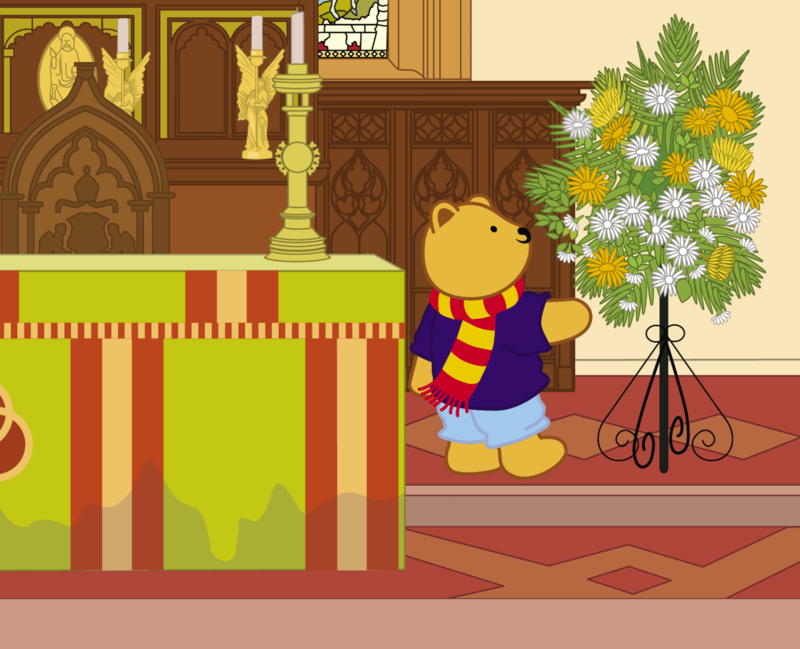 Moving away from the flowers, Teddy Horsley walks across the sanctuary and stands now on the left hand side of the high altar. He takes a deep breath and sniffs the air again. There he smells the rich fragrance of the incense. He sees the brass thurible swinging gently on its chain. He sees the gentle clouds of smoke rise up through the air wafting the delicate perfume in the praise of God. When Teddy Horsley walks in front of the High Altar to the left hand side he sees the brass thurible hanging from its brass chains. 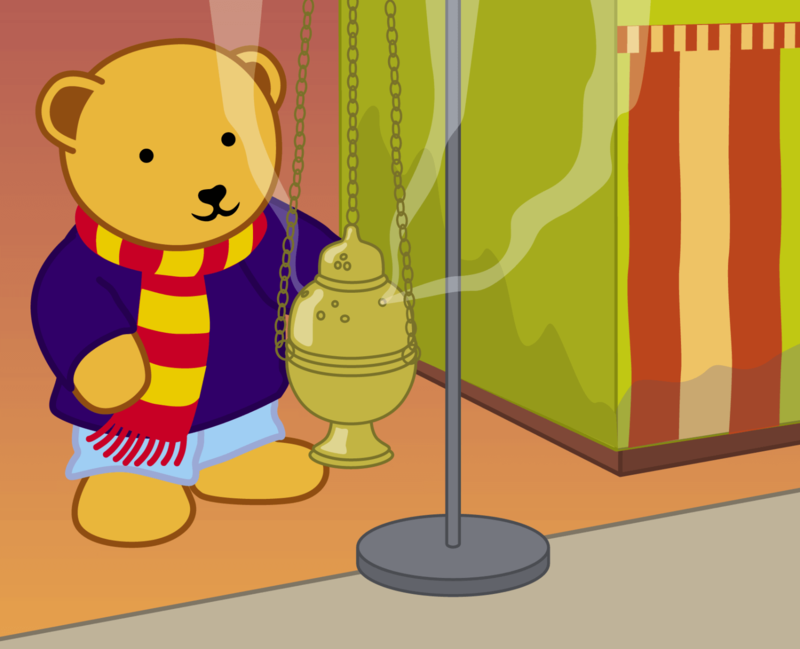 The thurible is used to burn incense on hot charcoal. In some of the Cathedral services the thurible is swung from side to side to help the charcoal burn with greater heat. Another angel with a golden censer came and stood at the altar; he was given a great quantity of incense to offer with the prayers of all the saints on the golden altar that is before the throne. And the smoke of the incense, with the prayers of the saints, rose before God from the hand of the angel. Inside Bangor Cathedral Teddy Horsley stretches out his paws and feels the different shapes. He goes into the choir stalls and touches the angels carved onto the bench ends. Inside Bangor Cathedral Teddy Horsley begins his journey back from the high altar to the West door where he first came into the cathedral. On his way down through the chancel, Teddy Horsley stretches out his paws and feels the different shapes. He goes into the choir stalls and touches the angels carved onto the bench ends. He traces the delicate feathers on their wings. The choir stalls in Bangor Cathedral were added during the restoration undertaken by Sir George Gilbert Scott during the second part of the nineteenth century. Two things deserve special notice about the choir stalls. The choir stalls are adorned by carved beasts, dragons, angels, griffins, musicians, faces, green men, people, animals, and hidden away a monkey climbing a tree and a quacking duck. The Cathedral Chapter comprises twelve Canons and each Canon has his or her own named stall. There are also stalls for the Dean, for the Residentiary Canon and for two Minor Canons. Looking toward the altar on the left-hand side the stalls carry the Latin names: Canonicus Residentarius (Residentiary Canon), Archidiaconus Bangoriensis (Archdeacon of Bangor), Praebendarius de Penmyndd (Prebendary of Penmyndd), Canonicus Primus (First), Canonicus Secundus (Second), Canonicus Tertius (Third), Canonicus Quartus (Fourth), and Canonicus Minor (Minor Canon). On the right-hand side the stalls carry the Latin names Decanus (Dean), Archidiaconus Merionethiensis (Archdeacon of Meirionnydd), Praebendarius de Llanfair (Prebendary of Llanfair), Thesaurarius (Treasurer), Chancellarius (Chancellor), Praecentor (Precentor), Canonicus Quintus (Fifth) and Canonicus Minor (Minor Canon). Teddy Horsley feels his way along the pews from one shape to the next. He goes into the Bishop’s throne and stretches out his paws to touch the shield. Teddy Horsley feels his way along the pews from one shape to the next. He climbs up into the bishop’s throne. He sees the great seat where the bishop sits on special and important occasions. He stretches out his paws and touches the shield. This is the shield of the Diocese of Bangor, and at the top of the shield is the bishop’s mitre. Teddy Horsley invites us to come and look. The name ‘cathedral’ comes from the Latin word meaning ‘chair’. Literally, the Cathedral is the place in which the Bishop of the Diocese has his (or in some places her) special seat. The Bishop’s seat is a sign of authority, and the Bishop is ‘enthroned’ in the seat during the majestic service of installation. The present Bishop, The Right Revd Andrew John is eighty-first Bishop of Bangor. Although Bishop Andrew has his seat in Bangor Cathedral, the Bishop is not in charge of the Cathedral. The Cathedral is run by the Dean and Chapter. The current Dean is the Very Revd Dr Susan H Jones who is the fifty-sixth Dean of Bangor. Before leaving Bangor Cathedral, Teddy Horsley looks around one more time. 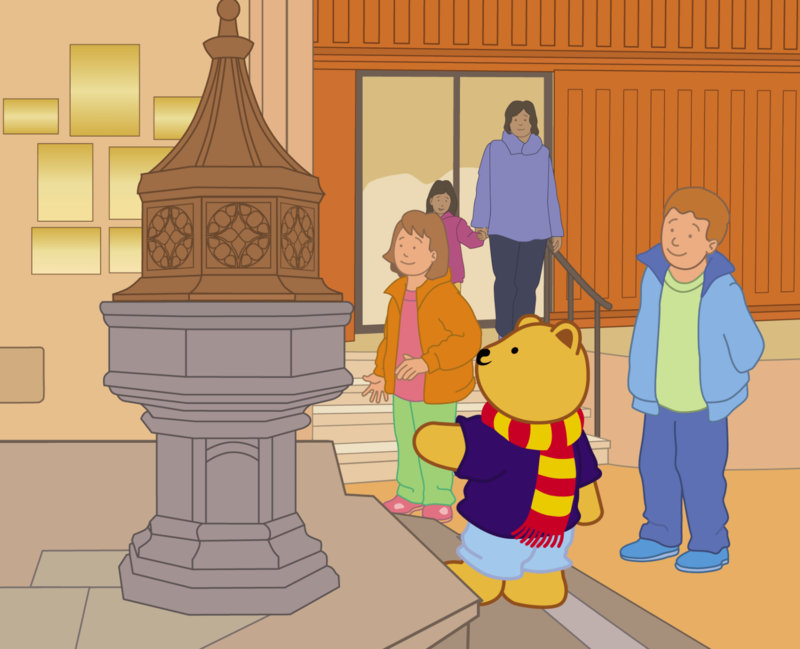 At the back of the Cathedral he visits the font where people go to be baptised. Teddy Horsley has made his way back to the great West door. Before leaving Bangor Cathedral, Teddy Horsley looks round one more time. Now he thinks about all the important and holy things that take place in the ancient cathedral today. At the back of the cathedral Teddy Horsley visits the font where people go to be baptised. Teddy Horsley has retraced his steps and gone back to the big glass doors at the back. He first entered the Cathedral through that door. Now Teddy pauses to look at the font. The font is placed by the main entrance to remind people that baptism is the way into membership of the Christian Church. The font is a big bowl to hold water for baptism. In Bangor Cathedral, the Church in Wales welcomes people of all ages to profess their faith in Christ through the sacrament of baptism. When adolescents or adults are baptised they speak out their faith in Christ and make promises to follow Christ. When infants are baptised their godparents speak out on their behalf. People who are baptised as infants have the opportunity to confirm these promises when they are old enough to do so at the Confirmation service. Teddy Horsley walks up the centre aisle right from the back to the front. At the front he visits the nave altar where the priest celebrates holy communion. Teddy Horsley walks away from the font at the back of Bangor Cathedral. He walks up the centre aisle right from the back to the front. At the front he visits the nave altar where the priest celebrates holy communion. There he sees the fine altar frontal, the white cloth over the top of the altar and the two candle stands. When Teddy Horsley visited the sanctuary he saw the High Altar where the 8:30am said communion service is celebrated on Sunday. Now Teddy Horsley is visiting the Nave Altar where the 11:00am choral communion service is celebrated. During that service members of the congregation bring bread, wine and water from the back of the Cathedral for the priest to place on the altar. The priest takes the bread, gives thanks to God, breaks the bread, and shares it with the people. The people come to kneel or stand at the altar rail and to each person who receives communion the priest gives the bread, saying ‘the Body of Christ’, and gives the cup, saying ‘the Blood of Christ’. Before leaving Bangor Cathedral, Teddy Horsley looks to the left of the nave altar. There he sees the tall pulpit where the bishop preaches the sermon. To the left of the Nave Altar stands the impressive stone pulpit. The pulpit is used by the clergy to preach and to teach. In the days before microphones the pulpit was made tall to help the preacher’s voice carry to the back of the Cathedral. This pulpit was placed in Bangor Cathedral in memory of the Revd Morris Williams MA, late Rector of Llanrhyddlad and Rural Dean. The inscription reads ‘an eminent Welsh scholar, poet and divine, 1810-1874. One of the faces of the pulpit shows Jesus at the beginning of his ministry, when he came proclaiming, ‘Repent ye, for the Kingdom of God is at hand’ (Matthew 4: 17). Another of the faces of the pulpit shows Jesus at the end of his life on earth, when he commissioned his disciples, ‘Go ye into all the world. Preach the Gospel to every creature’ (Mark 16: 15). 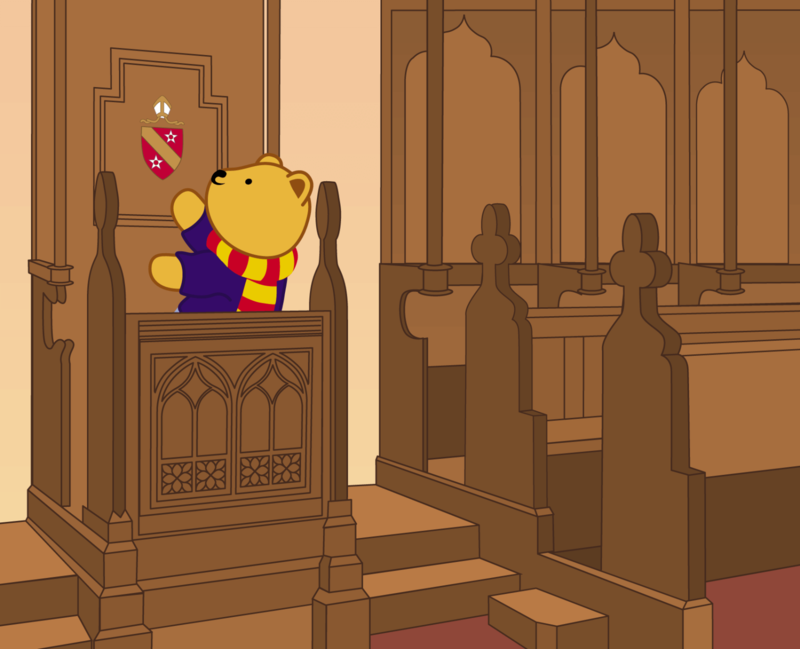 Turning away from the pulpit, Teddy Horsley looks to the right of the nave altar. There he sees the bright brass eagle, the lectern where people read from the Bible. The Lectern is placed at the front of the Nave to the right of the Nave Altar. On Sunday morning at the communion service someone from the congregation comes forward to read from the Bible at the lectern. On Sunday morning there is usually one reading from the Old Testament and one reading from the New Testament before one of the clergy reads the Gospel reading from the centre of the Nave. 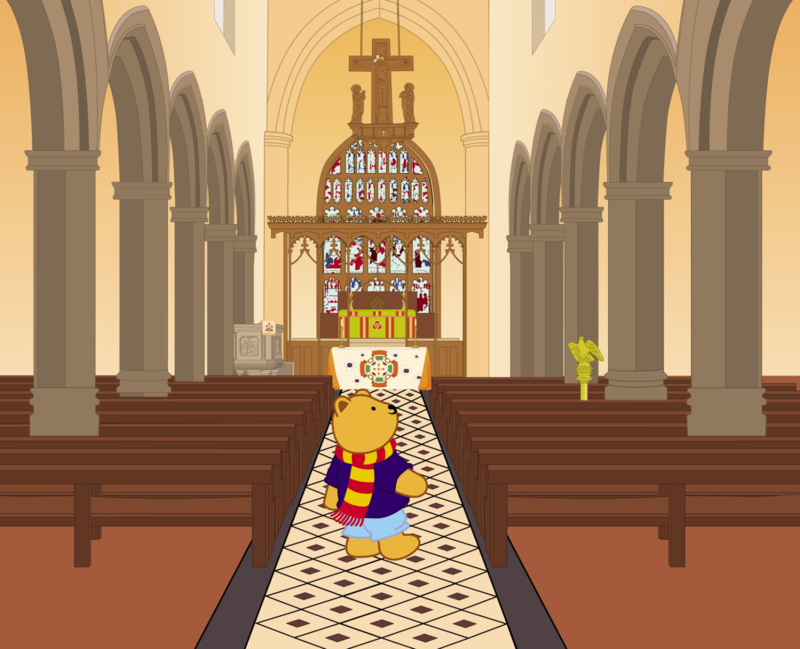 Before leaving Bangor Cathedral, Teddy Horsley visits the Lady Chapel. There he stands and writes a prayer for others to read and pray. Before leaving Bangor Cathedral, Teddy Horsley visits the Lady Chapel. The Lady Chapel is a quiet place prayer dedicated to the Blessed Virgin Mary, the mother of Jesus. 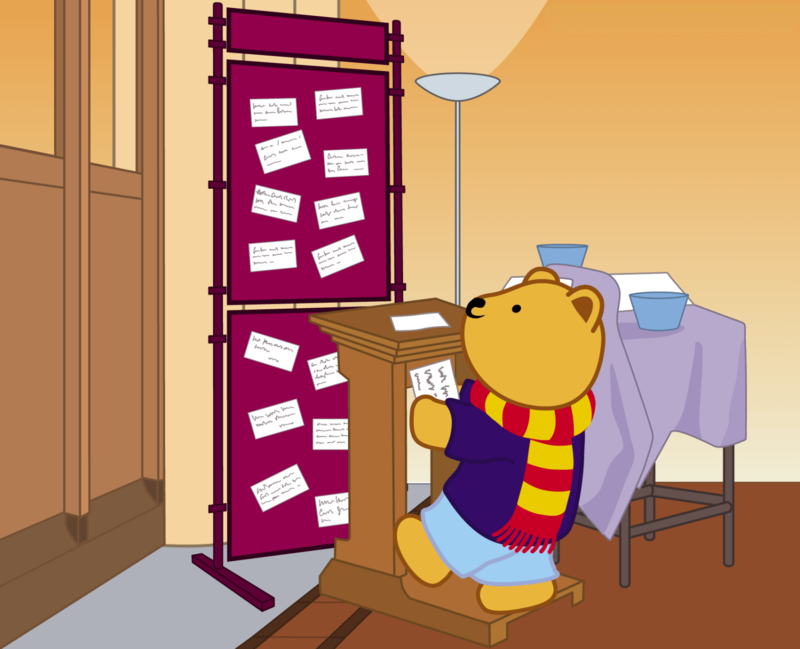 There in the Lady Chapel Teddy Horsley sees a desk, pens, and a large board where people have pinned their prayers. Teddy Horsley picks up a pen and writes his prayer for others to read and pray. He invites us to write a prayer too. The Lady Chapel is part of the Cathedral dedicated to the Blessed Virgin Mary, the mother of Jesus. There is a statue to Mary in the Lady Chapel that occupies the South Transept. In the Lady Chapel it is worth noting the mural in the arch above the altar. It shows Jesus on the Road to Emmaus after his resurrection being welcomed by two people into their home. Today the Lady Chapel houses the Cathedral prayer board or prayer book where local people and visitors alike are invited to place their prayers. These prayers are offered to God by the Cathedral staff. There in the Lady Chapel, Teddy Horsley looks at the flickering flames of the votive candles and offers his prayer to God. 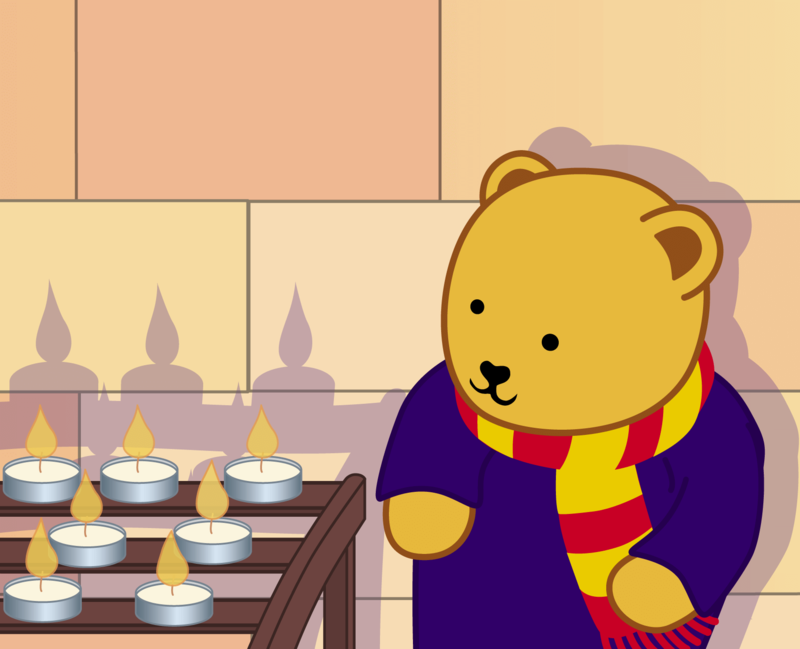 There in the Lady Chapel, next to the prayer board, Teddy Horsley sees a candle stand holding votive candles. He sees people coming into the Lady Chapel, lighting a candle and standing quietly while they offer their prayer to God. Teddy Horsley adds his prayer to theirs. Teddy Horsley knows that God listens to his prayers. The Lady Chapel in Bangor is set aside as an area for prayer, reflection and meditation. As well as the prayer desk, there are comfortable seats to help people to sit and to relax. There are also two features to help people focus their prayers. The prayer board or prayer book is there to help people formulate their prayers as well as to ask others to pray with them. The votive candles are there to help people offer their prayers to God in another way. The Cathedral shop stocks books about prayer and books of prayers. The Cathedral staff are there to help as well. 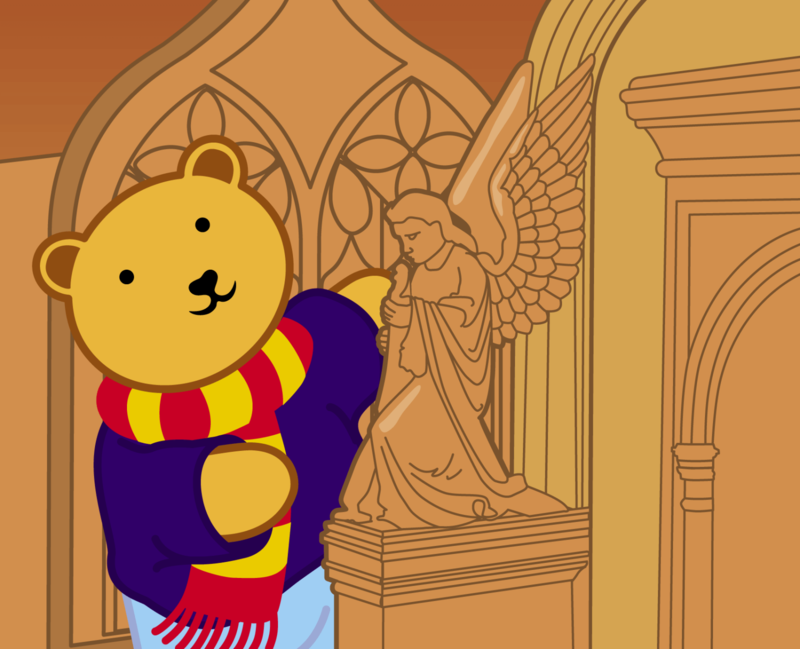 Teddy Horsley is a bear who enjoys visiting cathedrals. Today, he enjoyed visiting Bangor Cathedral very much. 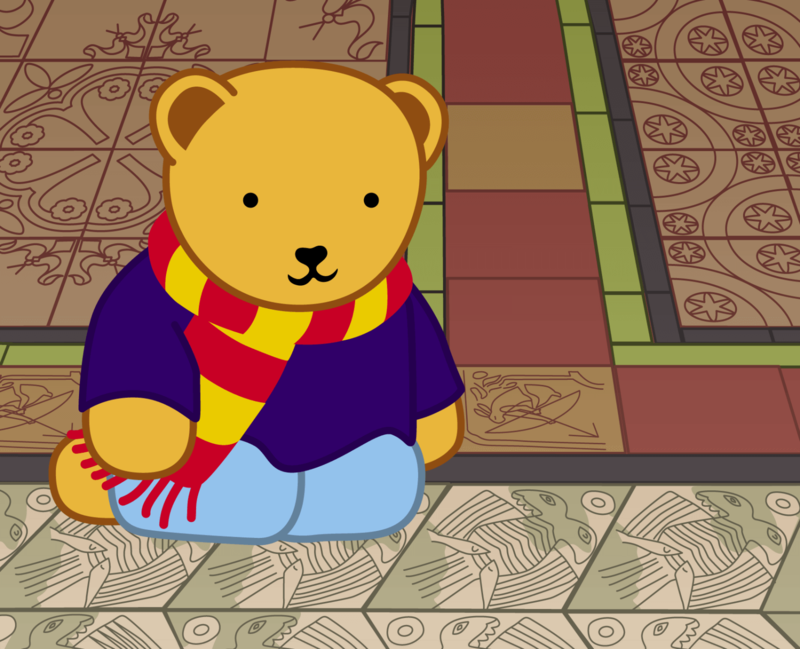 Teddy Horsley is a bear who enjoys visiting cathedrals. Today Teddy Horsley visited Bangor Cathedral in North Wales, with his friends, Mr and Mrs Henry, Lucy and Walter and Betsy Bear. Teddy Horsley is so pleased that we decided to come with him. Teddy Horsley enjoyed visiting Bangor Cathedral very much. He hopes that we have enjoyed our visit too. Bangor Cathedral is a small cathedral with a small budget, a huge heart and a great vision for God’s mission in the City and Diocese of Bangor.